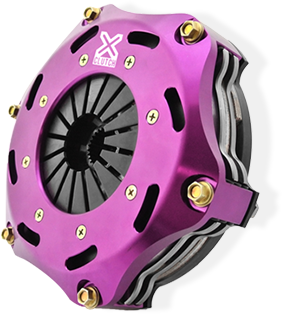 The 9" (230mm) range of XClutch kits are available in organic, ceramic and carbon and offer exceptional torque capacity for high powered vehicles. The twin disc organic range is ideal for high horsepower street use whilst the ceramic and carbon options are focused on track use where a higher heat capacity is often required. These kits are available in twin or triple plate configurations depending on the application and all come with a lightweight, push type alloy cover. These kits are also available for a variety of vehicles that utilise a pull type pressure plate from factory. These conversion kits come supplied with all of the components required to successfully convert the vehicle to push type.